Synthetic peptide derived from within residues 950 to the C-terminus of Human Insulin degrading enzyme/ IDE. Our Abpromise guarantee covers the use of ab32216 in the following tested applications. WB Use a concentration of 1 µg/ml. Detects a band of approximately 118 kDa (predicted molecular weight: 118 kDa).Can be blocked with Human Insulin degrading enzyme / IDE peptide (ab32215). Lanes 1 - 4: Merged signal (red and green). Green - ab32216 observed at 120 kDa. Red - loading control, ab8245, observed at 37 kDa. ab32216 was shown to specifically react with Insulin degrading enzyme / IDE in wild-type HAP1 cells. No band was observed when Insulin degrading enzyme / IDE knockout samples were examined. Wild-type and Insulin degrading enzyme / IDE knockout samples were subjected to SDS-PAGE. ab32216 and ab8245 (loading control to GAPDH) were diluted at 1μg/ml and 1/10,000 respectively and incubated overnight at 4°C. 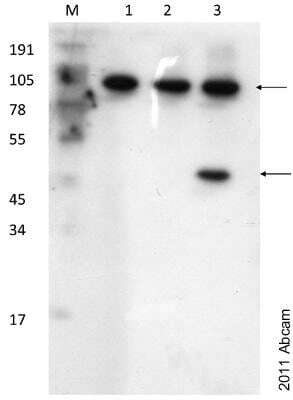 Blots were developed with Goat anti-Rabbit IgG H&L (IRDye® 800CW) preadsorbed (ab216773) and Goat anti-Mouse IgG H&L (IRDye® 680RD) preadsorbed (ab216776) secondary antibodies at 1/10,000 dilution for 1 hour at room temperature before imaging. Immunofluorescent staining for Insulin degrading enzyme/IDE in rat brain rat hippocampus using Rabbit polyclonal to Insulin degrading enzyme/IDE (ab32216). . The staining is located in the neuronal soma and is finely punctuated. The picture was acquired using the X20 objective. Protocol details: Rats were intracardially perfused with 4% paraformaldehyde. Whole brain tissue was post-fixed overnight in the same fixative, and cryoprotected in 20% sucrose and frozen in OCT. 30µm coronal sections were cut by cryostat for use in fre floating IHC. Primary antibody ab32216 was incubated overnight at 1/100 at room temperature. Secondary antibody Alexa fluor 488 1/1000 was incubated for 2 hours at room temperature. ab32216 staining human Gall bladder. The paraffin embedded human skin tissue was incubated with ab32216 (1/50 dilution) for 30 mins at room temperature. The staining is predominantly cytoplasmic although some nuclear staining can be seen. Antigen retrieval was performed by heat induction in citrate buffer pH 6. Ab32216 was tested in a tissue microarray (TMA) containing a wide range of normal and cancer tissues as well as a cell microarray consisting of a range of commonly used, well characterised human cell lines. I would like to order ab133561 as a replacement for ab32216. Please can you tell me how I do this - is there a code to enter when ordering? I am sorry this antibody did not perform as stated on the datasheet and for the inconvenience this has caused. As requested, I have issued an aternative free of charge replacement of ab133561 with the order number 1213991. Please note that this free of charge replacement vial is also covered by our Abpromise guarantee. Should you still be experiencing difficulties, or if you have any further questions, please do not hesitate to let me know. 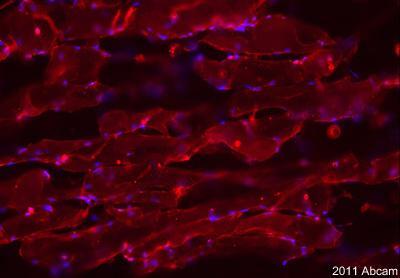 Thank you for your reply; I would be happy to try another Abcam antibody for the same protein. Could you tell me if you recommend ab133561 for human WB? Would this also be covered by the guarantee if (in the unlikely event) it fails to work? I would like to reassure you that we monitor feedback closely on a weekly basis and we are not currently concerned about the general quality of ab32216 IDE antibody or this batch. Regrettably, I can suggest you have received a bad vial on this occasion. Therefore, we would be pleased to provide a replacement from the same antibody, which will still be covered by our guarantee. Alternatively, I fully understand your concerns and if you prefer an alternative replacement of ab133561 or a credit note in this case, I will be pleased to arrange this for you. I can confirm that ab133561 IDE antibody is tested and guaranteed for both human samples and WB. All tested applications and species covered by the 6 month guarantee are listed on the individual datasheets. The replacement vial will also be covered by the guarantee. Thank you for your reply, however I'm afraid I don't quite understand your answer and there may be some confusion here. The stable transfection was of choline transporter-1 and not IDE, and I am trying to determine the endogenous IDE levels. 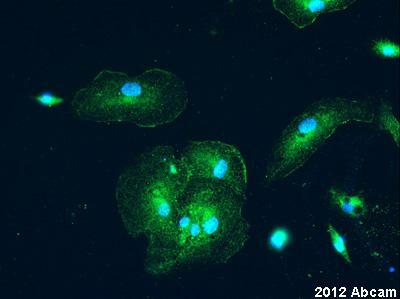 The same antibody was used successfully for ICC and for loading controls, I have attached an image of pan-PKB. I apologize for the confusion, this is clearer to me now. I am sorry to hear the suggestions made have not improved the results on this occasion. Unfortunately, reviewing the details I am uncertain as to why this antibody is not working in WB for you when it is giving successful results in ICC. I appreciate the time you have spent on these experiments and would be pleased to arrange a free of charge replacement or credit note in compensation. Sample (Species/Cell extract/Nuclear extract/Purified protein/Recombinant protein etc.) Human cell extract (SH-SY5Y) stable transformation of choline transporter 1. Sample preparation (Buffer/Protease inhibitors/Heating sample etc.) Lysis buffer: 50mM Tris-HCl pH7.5, 150mM NaCl,1% Triton X-100, Protease inhibitors: 1mM AEBSF, 10ug/ml leupeptin, 25ug/ml aprotinin, 10ug/ml pepstatin A, 700 Units DNAse. Sample buffer (3x): 6% SDS, 0.1875M Tris-HCl pH6.8, 30% Glycerol, 0.015% Bromophenol blue, 7.5% 2-mercaptoethanol. Sample heated 10 mins 55 deg C.
Transfer and blocking conditions (Buffer/time period, Blocking agent etc.) semi-dry transfer (Bio Rad semi-dry transfer cell), PVDF membrane (pre-wet in methanol), Transfer buffer: 14.5g/L Tris-HCl, 7.25g/L Glycine, 20% methanol. Blocking: 8% milk in washing buffer, 1hr. Washing buffer: 1x phoshphate buffered saline pH 7.4, 0.15% Triton X-100. Primary Antibody (Manufacturer/Species/Diluent/Dilution/Incubation time, Wash step) ab32216, rabbit polyclonal to Insulin Degrading Enzyme. Diluted 1/1000 in 8% milk in 1xPBS + 0.15% Triton X-100, overnight, 4 deg C. Washed 2x 30 seconds + 3x 10 minutes in washing buffer. Secondary Antibody (Manufacturer/Species/Diluent/Dilution/Incubation time, Wash step) goat anti-rabbit-HRP (IgG). 1/10,000 in 1x PBS +0.15% Triton X-100, 1hr room temperature. Washed 2x 30 seconds + 3x 10 minutes in washing buffer. Positive and negative controls used (please specify) Positive controls = successful detection of other antibodies e.g. phospho-PKB (Cell Signalling #4060). 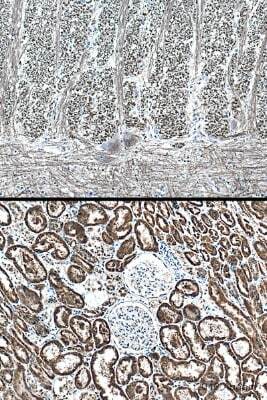 Additionally, detection of signal with immunohistochemistry in same cell line. How many times have you tried the Western? Twice. First attempt was after blot had been stripped three times, so repeated with fresh (unstripped) blot. 1. There are inherent difficulties with antibody detection of recombinant tagged proteins that I can recommend considering. This may be a biological artifact rather than a problem with the antibody. Could you confirm that the protein transfected is full length and includes the immunogen sequence? Also, if the recombinant IDE is tagged, it is possible that the tag is preventing access to the antibody. Could you confirm at which region of the protein the tag has been placed? 2. Could you confirm the species from which the recombinant IDE gene was taken? 3. Could you confirm how the stability of transfection has been assessed? 4. I can recommend that due to the points described above, it is important to use an endogenous positive control sample. 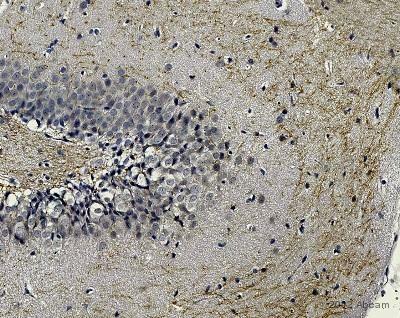 For example, this antibody has been used successfully on mouse and rat brain lysate. 5. Has the transfer of protein to the membrane and quality of the sample been assessed using a loading control? 6. Was the same antibody used for detection of a signal in the ICC experiments? I hope this information is helpful, thank you for your cooperation. Should the suggestions not improve the results, please do not hesitate to contact me again with the further requested details. I hope we can resolve this case for you as soon as possible. I recently purchased ab32216 Anti-Insulin degrading enzyme. Although it is listed to react with human, I cannot get it to work in Western blot for my human cell line (SY5Y). I was wondering if you could help me trouble-shoot this? I applied the primary and secondary (HRP conjugated enzyme) at the recommended concentrations to 50ug of protein and tested up to 15 minutes exposure to ECL. I would be pleased to help troubleshoot, and also obtain more information for our quality monitoring records. In order to proceed with this, I have enclosed a technical questionnaire below. I would appreciate if you could complete this. It will help you put the information we require together very easily which will enable us to better understand the problem and provide assistance. I would appreciate if you are also able to provide an image which would help us to assess the results.